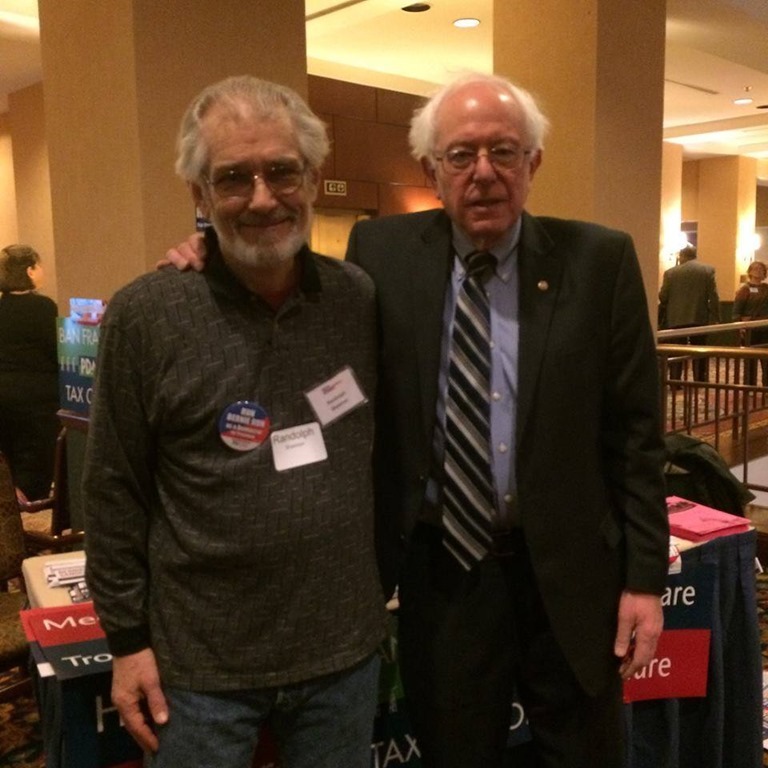 July 13, 2016 – As a member of the Progressive Democrats of America, New Brighton resident Randy Shannon was one of those who wanted self-described democratic socialist U.S. Sen. Bernie Sanders to run for president. With Sanders, of Vermont, conceding Tuesday that Hillary Clinton will be the Democratic presidential nominee, the dream of a Sanders presidency is over, but Shannon, who was elected a Sanders delegate from the 12th Congressional District, was not too upset. “I’m pretty satisfied with the progress that’s been made,” he said, pointing to issues such as expanding Medicare and Medicaid, protecting Social Security and replacing free trade deals with fair trade that he said would have gone ignored if not for Sanders. Beaver Falls resident Linwood Alford stood behind Sanders with other supporters during an address on labor issues before a Pittsburgh rally in March during the primary and ran unsuccessfully to be a Sanders delegate. Alford was happy about the endorsement. “We don’t want Trump in there so you know that was going to happen,” he said. Sanders spotlighted issues that “have to be dealt with,” such as mass incarceration and raising the minimum wage, Alford said. “They’re part of the problem that’s going on in America,” he said. Coleman Leggett, a 22-year-old Florida native now working as an organizer in Allegheny County for the Clinton campaign, was initially a Sanders supporter up until a few months ago. Leggett said the supposed political divide between Clinton and Sanders has been greatly exaggerated. “More or less, Sen. Sanders and Hillary Clinton have more in common than people give them credit for,” he said. Diehard Sanders supporters, some of whom have pledged never to vote for Clinton, should take solace in a Democratic campaign much more in touch with their views than presumptive Republican nominee Donald Trump, Leggett said. “This is the most progressive platform and the most progressive campaign the Democrats have seen in recent years,” Leggett said. As for those delegates pledged to Sanders, such as Shannon, he said there are still issues that need to be addressed during the Democratic National Convention in Philadelphia in about two weeks, such as the role of superdelegates in the 2020 race. Sanders supporters have criticized the existence of superdelegates, typically party officials and leaders, who are free to support whomever they choose regardless of primary results. Calling Sanders “a beam of light in the darkness" to those who were previously turned off to politics, Shannon said his supporters will not quit just because of Tuesday’s endorsement. “We’ve made some real gains and we’re going to continue to fight to see that those gains are implemented,” he said. Alford predicted that Sanders will campaign deep into the general election race to convince his supporters to back Clinton, who likely could not sway them herself.